Successfully Added Huadoo V3 Rugged IP68 Phone - Waterproof, Dust Proof, 4 Inch Display, MTK6582 1.3GHz Quad Core CPU, 3G, Android 4.4 OS (Yellow) to your Shopping Cart. 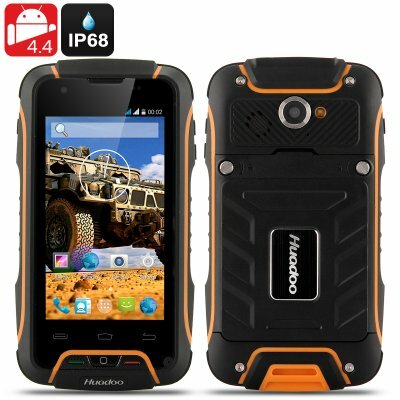 The Huadoo V3 Rugged IP68 Phone is Waterproof and Dust Proof while it has a 4 Inch Display, an MTK6582 1.3GHz Quad Core CPU, 3G connectvitiy and Android 4.4 operating system. A MediaTek quad core processor and an IP68, that is a solid combination that the Huadoo V3 smartphone posses. With a 4 inch display and 854x480 resolution as well as OGS so you can get great interaction as well an incredible viewing while being resistant to scratches. The exterior rugged makes this phone completely protected from the ingress of water and dust particles. With 8GB of internal memory, you can save your music library and apps directly onto the phone or use a micro SD card as there is a slot available for that too. The rugged exterior supports an intelligent Android 4.4 operating system that provides plenty of features. Android 4.4 comes with a new immersive mode that hides everything except the app you’re using. Once you’re done, just swipe the edge of the screen to bring back your status bar and navigation buttons. Also Android 4.4 comes with support for cloud storage solutions such as Google Drive built into the operating system. This means that you can save and open directly from the cloud, without having to save into your device’s storage first. Next time you’re heading out into the woods, don’t forget to bring the Huadoo V3. This product is in stock now, we guarantee next working day shipping and offer a 12 months warranty on all our products. Brought to you by the leader in electronic devices as well as wholesale Android rugged phones, Chinavasion.